Crosstown Tickets is your destination for the best prices throughout the season for both Cubs and Sox Tickets. We have made a name for ourselves since we started our company by selling Cubs and Sox tickets for less than the competition. For the 2019 season, the Cubs vs White Sox Crosstown Cup has reverted back to the two and two format similar to what we saw in 2017. There will be two weekday games played at Wrigley Field in June 2019, and two weekend games played at Guaranteed Rate Field in July 2019. The Crosstown Cup had expanded, in 2018, back to the six game series format, with three games at Wrigley Field in May, and three games at Guaranteed Rate Field in September. This is different than the four game, two and two in consecutive days, as it was in 2017. Also, both series will be played over a Friday, Saturday, and Sunday weekend, as opposed to the Monday through Thursday series in 2017. Here is the full Crosstown Series schedule, with links to Opening Day as well. Find other MLB teams and learn more about saving money buying from Crosstown Tickets! Round 1: South Side, 3-1. The Cubs slide back into a first place tie with the Brewers thanks to a 7-2 victory on an INTERESTING afternoon at Wrigley Field. John Lackey hit Jose Abreu twice and Matt Davidson and Yoan Moncada once, which lead Chris Beck to hit Ian Happ... prompting both benches to be warned and a rant from Hawk Harrelson. At the plate, Willson Contreras belted his 16th homer, a three-run shot in the 1st to put the Cubs up early and added another RBI later. In other oddities Carlos Rodon had a funky four-inning start allowing four runs but racking up 11 strikeouts... oh and Kris Bryant was ejected for the first time arguing a check swing call. The Cubbies ensure at least a split of the 2017 Crosstown Cup with an emphatic victory tonight. Jake Arrieta carried a no-hitter into the 5th for the Cubs, while Yoan Moncada hit his first career big-league home run for the Sox. For the first time since 2013, the Cubs win the Crosstown Cup by taking the series three of four from the Sox. Kyle Schwarber had two homers and a triple (!!) 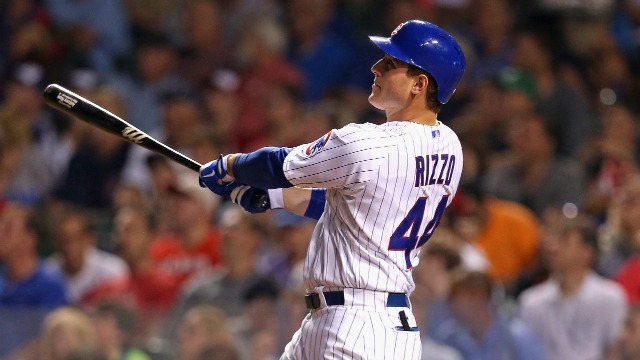 in a four RBI night, while Anthony Rizzo also went yard for the Cubs. Jose Abreu tried his best with two homers of his own, but the South Side falls short and loses the Cup for the first time in four years. The 2017 MLB Season starts with six teams playing Opening Day on Sunday April 2nd, including the Chicago Cubs at St Louis Cardinals at 7:35pmCT. Opening Day for the Chicago White Sox will be April 3rd against the Tigers. The Chicago Cubs home opener will be Monday April 10th vs the Dodgers, followed by the World Series Champions Ring Ceremony on April 12th vs the Dodgers. ROUND 1: South Side Wins 5-4. Tyler Saladino with the walk off single in the bottom of the 9th of a wild game at the Cell as the White Sox blow a 4-0 lead only to come back for the W.
White Sox keep the Crosstown Cup by virtue of guaranteeing a draw in 2016 after a draw in 2015 and winning 2014 3-1. The Sox defend home turf thanks to a 3-0 win tonight after gutty shoutout start from James Shields and a 1-2-3 9th from David Robertson. So it comes down to tomorrow. As we know, the White Sox already have retained the Cup, even with a Cubs victory to make it 2-2 tomorrow but the South Siders will look to win the series outright as Chris Sale (ya ready for this?!) faces John Lackey at 7:05. The 2016 Crosstown Classic ends in a 2-2 draw (Sox retain the Cup being the last outright winners in 2014) as the Cubbies get two runs off Chris Sale, add an insurance run late and Aroldis Chapman notches a four-out save to win both games at Wrigley Field. Kris Bryant, Ben Zobrist and Addison Russell had the RBIs for the Cubs, while Melky Cabrera drove in the Sox only run. The South Siders threatened late, but Chapman came in to strikeout Cabrera to end the 8th and delivered a perfect 9th. So now, for those of you who have divided Cubs-Sox households, peace can be brokered for another year. And to all of us Chicagoans, it's time to sit back and enjoy the pennant races for both teams. The Cubs are primed to make a deep run into October and the White Sox aren't out of it just yet, there were positive signs leading into the last two nights on the North Side. The Cubs win their first game of the 2016 Crosstown Classic in blowout fashion after Anthony Ranaudo carried a no-hitter into the 6th inning of his White Sox debut and hit a solo home run, his first pro hit ever. But then it was all Cubbies, Kris Bryant hit a solo homer in the 6th to end the no-hit bid, Javy Baez added a two-run shot and Addison Russell muscled a grand slam. And in his Cubs debut, Aroldis Chapman thrilled the sellout crowd, touching 103 MPH in a perfect 9th inning to end it. Chicago White Sox retrain the Crosstown Cup with a 2-2 series tie. How much to Cubs vs Sox Crosstown Series Tickets cost? Here is a quick breakdown by date. Remember that Crosstown Tickets does not add any service fees. The price you see is the price you pay. Every game is important, and the outcome of the Crosstown Series could be crutial to determining the fate of the White Sox this season. Chicago Cubs: According to FanGraphs, the Cubs are projected to win 94 games this season, which is the highest projected win total in baseball. It will be very interesting to see if the Cubs can live up to expecatations and even surpass last season's 97 wins. In Vegas, the Cubs are 7 to 1 favorites to win the World Series this year. This means if you bet $100 on the Cubs, you would win $700 if they win the World Series! Chicago White Sox: Despite a strong offseason, the White Sox are currently projected to be a .500 team this year. This would be an improvement on last season, when they ended the year 10 games under. One thing is clear, is the White Sox are going for it this year. The White Sox could surprise everyone this season and are likely to add more talent before the trade deadline. The Sox are more of a long shot to win the World Series this year, offering bettors excellent value at 50 to 1 odds. The 2015 MLB season began with the Chicago Cubs Opening Day vs St Louis Cardinals on Sunday April 5th at 7:05pm. This opening night game featured a pregame ceremony for the legendary Ernie Banks, with commemorative pins for each fan attending the game. It was certainly a memorable event. The first 30,000 fans also received a Giordano's 2015 Cubs Magnetic Schedule. View the full 2015 Chicago Cubs Schedule here. The first home series for the sox began with Chicago White Sox Opening Day on Friday April 10th at 3:10pm. The Sox faced the Twins after beginning their season on April 6th in Kansas City. All fans 21+ received a Miller Lite magnet schedule. 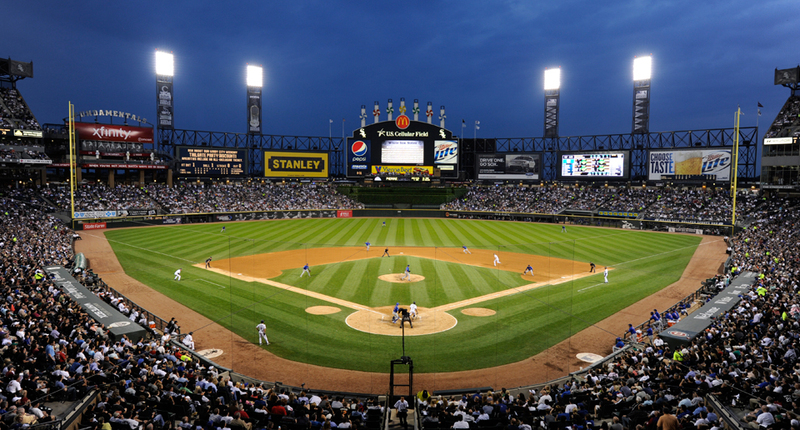 View the full 2015 Chicago White Sox Schedule here. The 2015 BP Crosstown Classic, began on July 10th at Wrigley Field with the Chicago White Sox at Chicago Cubs, game time 3:05pm. Game 1: South Side, 1-0. The White Sox win a pitcher's duel as a sacrifice fly by J.B. Shuck to score Emilio Bonifacio proves to be the only run of the Crosstown Cup opener. Kyle Hendricks and Carlos Rodon were the benefits of great defense, both go scoreless as the starting pitchers. Game 2: South Side, 5-1. The Sox take round two of the Crosstown Classic at Wrigley with a 5-1 victory over the Cubs. Tyler Flowers' two-run double in the 7th blew it open. Chris Sale went 7 innings allowing six hits and one run, with 10 strikeouts, while Jon Lester also went 7 allowing four earned with eight Ks. Game 3: North Side, 3-1. The Cubs (47-40) avoid being swept by the White Sox (41-45) heading into the All-Star Break with a 3-1 victory this afternoon at Wrigley. Jake Arrieta threw a complete game, allowing just two hits and one run with nine strikeouts while also belting his first career home run en route to his 10th win. Kris Bryant and Jorge Soler also had RBIs for the Cubs, as they got out to a 2-0 lead after the 1st. Adam Eaton had the only RBI for the Sox on a sacrifice fly in the 6th. Jose Quintana was a tough luck loser again, going 7.1 innings scattering eight hits and three runs also striking out nine. So, Bryant, Anthony Rizzo and Chris Sale are off to Cincinnati for the Mid-Summer Classic while everyone else gets to rest up before the second half begins Friday. This promises to be a fun end of the baseball season as the Cubs hold a one-game Wild Card lead and the Sox are making a surge in the AL, less than six games out of the Wild Card despite their inconsistent first half. The first series of the 2015 Crosstown Cup between the Chicago Cubs and Chicago White Sox ended with the Chicago White Sox taking 2 of 3, winning the first two games before the Cubs bounced back for game 3. The second series, which will determine if the Cubs or Sox will in the Crosstown Cup, will begin at US Cellular Field on Friday August 14th at 3:10pm. The White Sox have a talented team but have fallen mostly out of contention as the Cubs have recently surged into the lead for the #2 NL Wildcard. Will the White Sox be able to protect their current lead in the series and take home the Crosstown Cup, or will the Cubs assert their dominance and steal the Cup from the White Sox? Lower Box, Lower Corner, and Upper Deck Reserved tickets are still available for the Crosstown Series at US Cellular Field! Round 4: North Side, 6-5. The Cubs even the 2015 Crosstown Cup up at two games a piece and extend their winning streak to eight straight with a 6-5 victory in one of the more exciting Crosstown games in the series' history. This one featured back-and-forth action all afternoon at the Cell with both teams wearing their throwback uniforms to honor Ernie Banks and Minnie Minoso. Three runs were scored in the first inning, the Cubs struck on a sacrifice fly by Kyle Schwarber to score Dexter Fowler. Avi Garcia had an answer though, when he hit a two-run double in the bottom of the first. Chris Coghlan had himself a great game, hitting a three-run home run in the third to make it 4-2 Cubs. The Sox battled back in the fourth when Geo Soto hit an RBI single and came home to score on a two-run shot by Adam Eaton to go ahead 5-4. But the long balls weren't done yet, in the top of the fifth Coghlan hit a solo shot and Anthony Rizzo made it back-to-back to put the Cubs up 6-5 where they would stay for good. Kyle Hendricks and Jeff Samardzija both had rough starts. Hendricks lasted just 3.1 innings allowing eight hits and five earned runs with three strikeouts, while the Shark went six innings giving up nine hits and six earned with five Ks. Round 5: North Side, 6-3. The Cubs take their third straight game in the 2015 Crosstown Cup and make it nine consecutive wins overall with a 6-3 victory in a sloppy game tonight at the Cell. Since the Sox won the Cup last year, they have the tiebreaker which means the winner of tomorrow's 1:10 game takes it home for the year. It'll be Chris Sale against Dan Haren in the pitching matchup. After the White Sox went up 1-0 on an RBI groundout by Carlos Sanchez in the bottom of the second, but Dexter Fowler quickly tied the game with an RBI double in the third, scoring Addison Russell. Two innings later, Kyle Schwarber hit a single into right field scoring Russell again to put the Cubs up 2-1. Jorge Soler added an RBI single in the sixth, but it was quickly answered by an RBI double by Alexei Ramirez, so it was 3-2 North Side through six. Then the Cubs broke things open in the top of the seventh. The Sox looked like they'd have an inning-ending double play, but Ramirez made a throwing error allowing a run to score. Anthony Rizzo and Soler would add RBI hits to make it 6-2 Cubs. 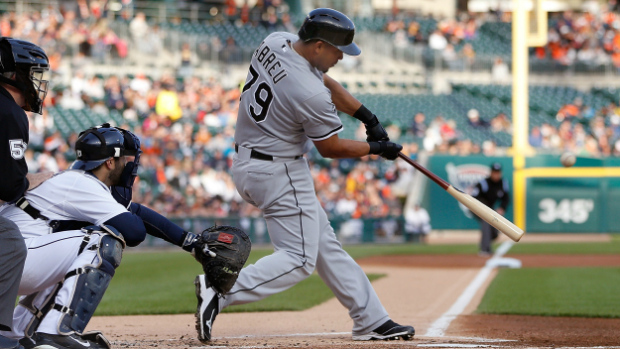 The Sox got one back off a Jose Abreu single, but that's as close as they'd get. Jake Arrieta gets the win, improving to 14-6 and tying the MLB lead for wins after turning in his 11th consecutive quality start. Arrieta went 6.2 innings, allowing five hits and two earned runs with five strikeouts. Jose Quintana was strong early for the Sox, but got in trouble in the middle innings, giving up seven hits and three earned with four strikeouts. So, the White Sox (55-60) snap the Cubs' (67-49) nine-game winning streak and in doing so even the Crosstown Cup 3-3, meaning they take home the trophy for the second straight year because they win the tiebreaker with their victory last season. The overall regular season record is now: White Sox 55, Cubs 47. This was one of the best editions of the Crosstown since it started in 1997, isn't great to have competitive baseball back in the greatest city in the world?! What is the Crosstown Classic? The Crosstown Classic is the match up between the Chicago White Sox and the Chicago Cubs. The match up consisted of 6 games, 3 per stadium, but recently switched to 4 games, 2 per stadium. The classic has also been refered to BP Crosstown Cup, The Windy City Showdown, Red Line Series, City Series, Crosstown Series, Crosstown Cup or Crosstown Showdown. When did the rivalry begin? Why is it called a Crosstown rivalry? Redline - The two stadiums are connected by the a north and south running "el", the CTA Red Line. The Red Line stops at Wrigley Field at Addison and at US Cellular Field at Sox-35th. North vs South - Cubs fans are considered to be Northsiders, with White Sox fans being Southsiders. This is due to the location of the stadiums. On the city grid, Wrigley Field sits at 3600 North while US Celluar Field sits at 3500 South. Have the Cubs and Sox ever played each other besides during the Crosstown Classic? In 1906, the Cubs competed against the White Sox for a World Series Title. The White Sox, known as the "Hitless Wonders" won 4 of the 6 games. This made them the winners of the 1906 World Series. Have the two teams ever gotten into a fight? There has been one major altercation beween Cubs and Sox players. During the game on May 20, 2006, the rivalry became more apparent when Cubs catcher, Michael Barrett, punched A.J. Pierzynski in the jaw. Brian Anderson of the White Sox hit a sacrifice fly, attempting to score Pierzynski. As he crossed home plate he collided with Barrett causing Barrett to drop the ball. All players leapt off the benches and a free-for-all broke out. Brian Anderson and Michael Barrett were both suspended and A.J. Pierzynski received a fine.